Five years ago anyone who told you that they regularly put their cat in a backpack and took them for a walk would’ve been looked at like they’d suddenly sprouted a second head. Times have since changed, social media influencers and internet-famous cats have helped transform the use of a cat backpack into socially acceptable, highly instagrammable, fun for all. It has wheels on the bottom so it can be pulled around. It can be strapped into a car and used as a cat car seat. To be fair cat rucksacks are worth investing in even if you have no intention of taking your cat with you on your next family hike, this is because they are a far more comfortable way of carrying your cat anywhere, be that to the vets, the pet groomer or the cat sitter. 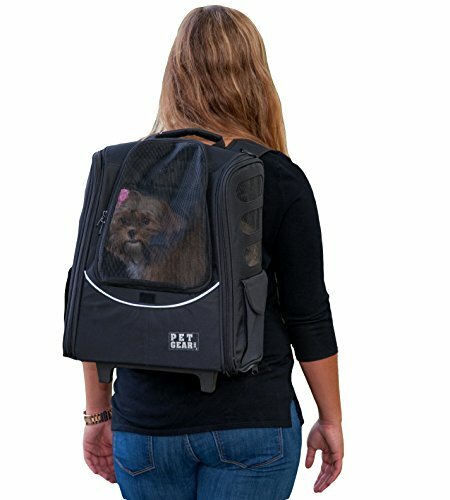 Instead of putting them in a standard handheld cat carrier and having to lopsidedly lug them about while awkwardly banging them with your knees a cat backpack allows you to transport your cat in comfort with no unnecessary bouncing about, it also leaves your hands free to do other things…like open doors with ease! Below we have reviewed 6 of the very best cat backpacks available, we hope you find this article useful in helping you make a purchasing decision. For further information on what to look for when making a purchase and how to train your cat to get used to their new bag skip to our guide here. The PetAmi Premium is a top quality, extremely comfortable cat bag. It measures 40.6 cm x 30.5 cm x 23cm and is ideal for small to medium-sized cats (up to 5kg) who appreciate the finer things in life. Available in purple, black, grey, pink, red, light blue, royal blue and the intriguing-sounding colours of heather charcoal and heather grey you will definitely be able to find a colour that suits you and your cat. Let’s be clear though the best cat carriers need to be comfortable. If it is not comfortable then your cat will hate it (even more than they otherwise would) and you will end up quickly consigning your new cat backpack to the back of the boiler room or the charity shop. So just how comfortable is the PetAmi Premium? It is made from 600D polyester. To most of us that doesn’t mean a great deal so allow me to explain.. The number 600D means that this polyester is some of the thickest polyester commonly used for bag making. 600D polyester is very strong so you need not worry about your cat managing to tear their way through the side of it. 600D polyester is also reasonably thick so will be comfortable for your cat to lean against. The inside bottom of the bag (where your cat will sit) features a very soft sherpa cushion perfect for lounging on. Due to its thickness it also helps absorb a lot of the bumps your cat may experience, acting as a soft of fabric suspension which helps to make their ride even more comfortable. 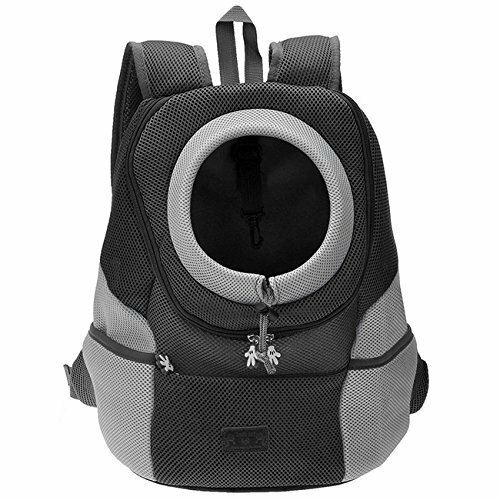 Well ventilated and with plenty of spaces for your cat to see out of and observe the scenery, the PetAmi rucksack is ideal for curious cats who enjoy taking in the sights and smells. It is very comfortable to carry weighing only 816 grams (without the cat) and featuring soft padded straps complete with a chest strap to keep it completely secure. It also has a handle on the top if you want to carry it like a suitcase (why would you though!?). a strap to clip your cat to inside it to stop them running off the second you unzip the bag. an attached collapsible bowl for drinks on the go. it is airline approved so if you need to take your cat abroad you’re onto a winner with this backpack. includes side pockets for storing treats and food in. Very comfortable soft sherpa cushion. Bubble backpacks were the original cat backpack that catapulted them into modern day consciousness via the instagram feeds of numerous feline influencers. The beauty of the bubble backpack lies in it’s comical simplicity. It’s iconic space capsule inspired bubble window reminds me of the windows you get at aquariums which allow you to get closer to the fish and feel like you are in the tank with them! The idea is that your cat will feel similarly immersed in the outside world as she (or he) sits inside the bag, pokes their head into the bubble, and has a good look at the world as you walk around. The bubble measures 15.5cm across and has three breathing holes at the top to prevent it steaming up and help your pet feel more at ease while using it. Measuring 39.9cm tall x 30cm wide x 15cm deep it can fit a medium-sized cat in it comfortably, however, we don’t recommend you put your cat in it if she weighs more than 6kg as they may struggle for room. It is available in black, blue and red plus a few off the wall options including a Union Jack print and a completely transparent version if you want to keep an eye on exactly what your cat is up to in there. If you’re after a different colour then don’t worry because there are loads (I counted more than ten) of different companies making very similar versions of this bag with miniscule differences. One of my favourite features of this bag is that it is designed to be used on both your back and your front, if the view if much better going forward and you have the type of cat that likes to see where they are going rather than where they have been then this is a great little feature. Although this bag isn’t going to break the bank that doesn’t mean it is cheap and nasty. In fact it is made of great quality materials which you can be confident will last. With a hard exterior shell made of food graded Polycarbonate plastic lined inside with oxford cloth; it is very strong and highly scratch resistant not to mention comfortable too! The bubble can be swapped for a breathable mesh cover (which is included with your purchase) if your cat struggles with anxiety when in enclosed spaces. This allows your cat to pick up smells through it, unfortunately, it isn’t hemispherical so they won’t enjoy quite as good a view through it. It also includes a buckle inside to secure your cat to so that they don’t escape into the unknown the second you unzip it! Gives cats a great 360° view. Available in black, red, blue, Union Jack and clear! Bubble can be swapped for a breathable mesh for anxious cats. Not suitable for big cats (over 6kg). The CozyCabin backpack is appropriately named. It is cosy, very cosy indeed – and not because it’s too small (it comes in 3 sizes M, L & XL – the two bigger sizes are more appropriate for dogs), but because it is incredibly well insulated and warm. The key thing to be aware of with this product is that it is designed to allow your cat to stick their head out of it. This is great in many respects as it allows them to take in all the sights and smells of their surroundings as well as freely receive all important head scratches. The one problem with it is that flightly cats may see it as an open invitation to attempt to escape. While the CozyCabin does include an inbuilt leash which we strongly recommend you clip your cat to at all times however while it will stop your cat from completely escaping it wont stop them from getting their front paws (and possibly more of their body) out of the viewing hole which will not only make you feel foolish but also makes for a distressing experience for your cat. 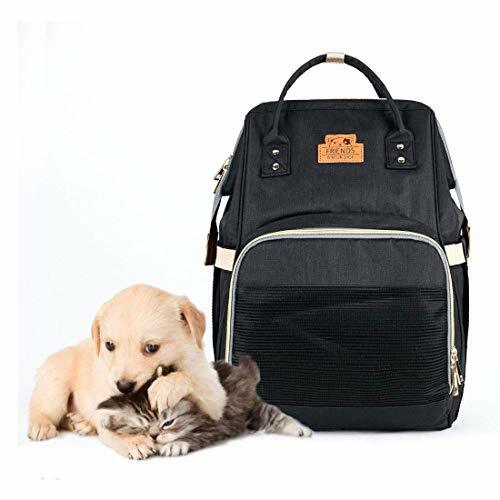 It is fair to say that this backpack is more suitable for dogs however if you do have a more senior cat who is fairly sedate and happy to watch the world go by without harbouring a great desire to interact with everything and everyone it sees then this bag could work for you. The CozyCabin is made from a combination of leather and canvas which makes for a very strong bag which should last. The carrier itself is constructed with breathable air mesh panels which will allow your cat to travel in comfort without feeling stifled. One thing which a few users have noted is that the bottom of the bag is quite hard though so it is a good idea to put a small towel or blanket down there if you know your cat is going to be in there for more than a few minutes. It also features two large storage compartments that are handy for storing treats and snacks (both for you and your cat). PLEASE NOTE SIZE : Dimensions in inches: Size M (top width 7.8 bottom width 12.0 height 13.3 neck hole size 7.1-18.8 weight within 6.6 lbs ) , Szie L (top width 8.0 bottom width 14.2 height 15.7 neck hole size 7.2-21.2 weight within 8.8 lbs) , Szie XL (top width 8.6" bottom width 14.9" height 17.7" neck hole size 7.0"-22.8", weight within 12 lbs). Suitable for Cat, Mini poodle, Mini Schnauzer, Mini Teddy, animals, Chihuahua, Yorkshire, Pomeranian, Minlature Pinscher and other similar size pets. Open head hole can be problematic for flighty or anxious cats. The KritterWorld rucksack is a small but functional bag measuring 41.9cm x 30.5cm x 38cm, it is perfect for small cats (less than 3.5kg). It does come in a range of different sizes (S,M & L) and is available in pink and blue the small KritterWorld bags are perfect for carrying kittens about in and are small enough to be airline approved. If you need one of the bigger bags then be warned these are, unfortunately, slightly too large to be used as airline approved carrier. So if you’re in the habit of making regular trips abroad with your cat then this probably isn’t the best bag for you unless you have a small cat or are only going to use it for kittens so you know you can manage with the small one. If you want a cheap functional bag which you can use to take your kittens to the vet or to their new owners then the KritterWorld bag is more than adequate. An internal leash to stop your cat running away when the bag is opened. Side pockets suitable for storing water bottles, snacks and treats. Adjustable waist straps to keep it extra secure. A removable padded matt to keep the bag comfortable for your cat while also being very easy to take out and wash.
A large zip-closed top opening for easy access. Padded straps making it comfortable to wear. Roughly 40% of the bag walls are mesh which your cat can see through and smell through so that they can enjoy their trip all the more. Ideal for small cats and kittens. Not suitable for big cats. Larger sizes are slightly too big to be airline approved. The Pet Gear I-GO2 is, unlike its cumbersome name, a brilliant, lightweight easily manoeuvrable bag which is far more than just a glorified cat bag. It also can be used as a cat car seat and a roller bag! I am a big fan of the roller bag function as this makes it the ultimate bag for airports. It is of an airline approved size and it’s telescopic handle (similar to what big suitcases have) combined with the wheels mean it can easily be transported around any airport hassle free. The wheels are very small though so they won’t absorb bumps very well, so its not a good idea to walk your cat down to the local park using the roller bag function as they will feel every tiny divot in the pavement as you go! The wheels are suitable for indoor use. It also has the unique feature of working as a car seat for your cat. It can be strapped into your car by threading the seatbelt through the fabric openings in the bag to keep it secure. This is much nicer for your cat than putting them in a standard cat carrier and then dumping them in the boot of the footwell of the car, it gives them a better view of what is going on and helps reduce the stress of travelling. As with all cat backpacks it includes a tether inside which we recommend you always use to prevent your cat fleeing the second the bag is opened. It measures 35.6cm wide x 22.9cm deep x 48.3cm tall and weighs 1.36kg. 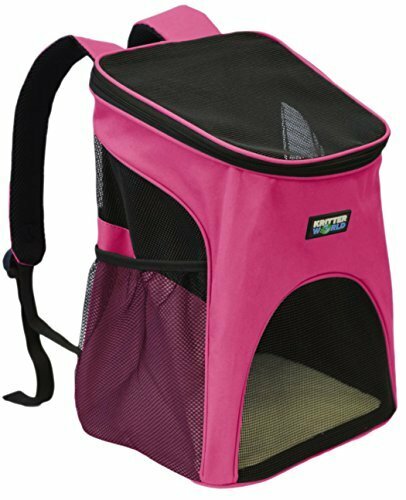 This is a big carrier, it can comfortably fit a small dog in it and can happily accommodate two amicable cats without any trouble. But if you need more space it can be made even bigger thanks to its fold out sides which give you an extra 7.6cm of space. In fact some users of the Pet Gear I-GO2 have made use of it’s considerable size to use it as a shopping trolley…apparently you can fit 6 cases of 12-pack soda in it! Has wheels on the bottom so it can be pulled around. Could be too big for small cats. The Ossack ‘Friends’ Pet Backpack look like the kind of backpack that you may carry your gym gear about in or take your lunch to work in, yet it is designed to carry cats (and dogs). Imagine your colleagues surprise when instead of pulling your tuna pasta from your bag you pull out a confused looking British shorthair cat…be careful you don’t make this mistake with this backpack! Personally I’m not too keen on backpacks which are overly obvious about the fact that they are designed for carrying an animal, I much prefer a more subtle bag like this as it means you can use it for other things without having people poking their nose in looking for a pet amongst the dirty clothes that you’re taking to the laundrette. The Ossack is waterproof so is suitable for long outdoor walks if your cat enjoys that kind of thing! It measures 40.6cm tall x 23.6cm wide and 18.6 cm deep giving it plenty of space for any cat weighing up to 5kg, to be honest, if your cat is a bit of a hefty chunky (6kg+) you will probably still manage fine with this bag providing your cat isn’t too skittish. This bag is also made from 600D Oxford Fabric which is a type of Polyester. Which means that it is some of the thickest polyester used for bag making, it is very strong so will prevent your cat from clawing their way through it! 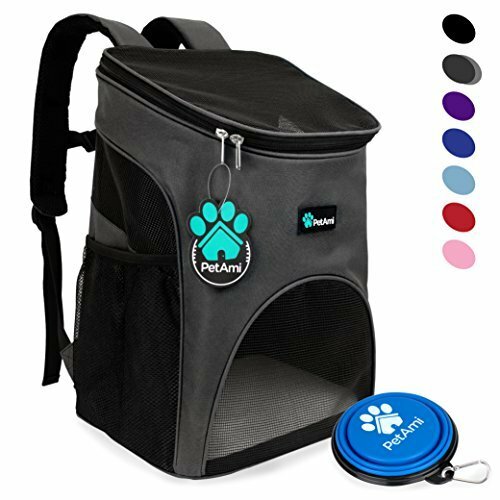 It has a mesh opening on the front and the top of the bag allowing your cat to see out and also meaning that the bag has good airflow so it doesn’t get too stuffy in there. It has detachable soft padding at the bottom of the bag which makes it easy to take out and wash should your cat have any accidents in there or you just want to get all the cat hair off it. It has two handy side pockets for which are big enough to store a good sized water bottle in. It also features two (yes two!) leashes. One small one inside the bag to stop your cat from escaping and a second longer one which seems to be more designed for dogs. The longer leash also attaches to the bag but allows your pet to walk alongside you. This could be useful for your cat depending on its temperament…some cats will hate being on a lead but you know your cat best so if you think they may respond well to it then, by all means, give it a go!  MATERIAL: Made of 600D Oxford Fabric. Waterproof. Breathable Mesh Window on the top and front,which could keep excellent air flowing. Plenty of space for cats up to 5kg. Not designed for big cats (6kg+). 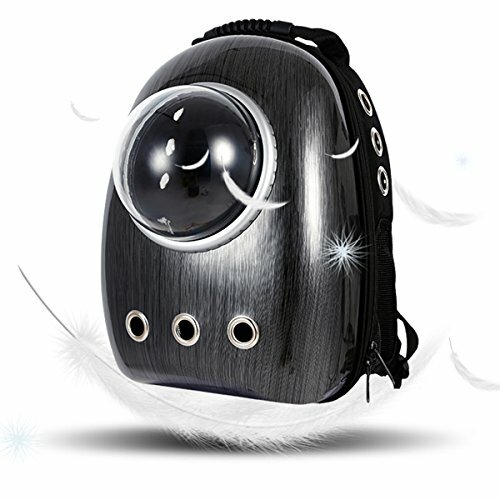 A cat backpack opens up a whole new world of excitement and intrigue to your cat. However, in order to first reach a point where your cat can be taken out in it without putting up an almighty fight you must first get your cat used to the new bag. When you get your backpack for the first time open it up and leave it in the middle of your room. This will allow your cat to have a good sniff of it, climb in and out of it and get used to the idea of it. Get some of their favourite toys and snacks and leave them in and near the bag, take a few of the snacks and hide them in different parts of the bag. This will help them to view the bag as a fun place to play this will help them build positive associations with it. When you feed your cats it dinner you can also place their bowl inside the bag in the days before your first use it, again this will help your cat to feel comfortable and at ease in and around the bag. Leave the bag out during the day in a place that your cat will see lots of it, this will help them to get more used to it. When your cat is completely at ease with the new bag you are ready for their first walk. Make sure that the first walk is short and fun…definitely don’t take them to the vet in it or they will then associate your lovely new cat rucksack with trips to their least favourite place! At first glance it can be easy to presume that a cat backpack is a what is says it is, there doesn’t appear to be a great deal of difference between them. A strong bag is important, it’s no good buying a cheap bag that will wear down over time because before you know it your cat will break out! 600D polyester is a good quality strong material which many bags are made from and which should withstand the test of time regardless of what your cat throws at it. Get your cat weighed before you purchase your bag. Most bags can comfortably accommodate a cat of up to 5kg in weight however if your cat weighs more than this you will need to look for a bigger bag to ensure that your cat is comfortable. Security is obviously vital. Cheap carriers which make use of cheap low quality zips often burst at some point when the zip becomes damaged. Ideally, your bag should have a high-quality zip preferably with a strap which wraps around the bag for extra security. Most decent bags will have a padded removable bottom piece for your cat to sit comfortably on, some cheaper bags will not and so your cat won’t thank you for buying one of them! Having open mesh spaces in your bag will allow good airflow in and out of the bag which will allow your cat to take in the sights and smells around them it will also prevent them from feeling claustrophobic or trapped and will help reduce any anxiety.